On Sept. 14, 2006, radio host Frank Beckmann interviewed Angus McBeath and Mackinac Center Director of Education Policy Ryan S. Olson on WJR-AM Detroit. Beckmann, McBeath and Olson discussed the Edmonton story and how it could apply to Michigan schools. To listen to that interview, go to www.mackinac.org/7998. To listen to a clip from McBeath’s presentation to the Issues and Ideas Forum on Sept. 13, 2006, go to www.mackinac.org/7928. To read more about the Edmonton story, see "Public Schools Can Provide a Choice to Every Parent" at www.mackinac.org/7923. 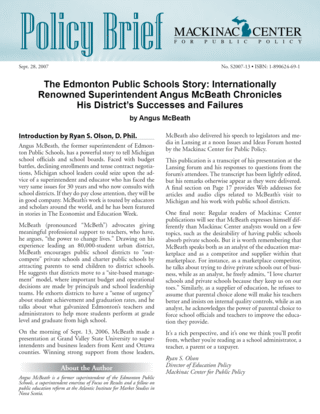 For coverage of McBeath’s visit to Michigan in September 2006, see Michigan Education Report, "Internationally known public school superintendent visits Michigan" available on the Web at www.educationreport.org/8026. For information about how McBeath and his organization might consult with a Michigan public school district, contact the Mackinac Center for Public Policy by e-mail at mcpp@mackinac.org or by telephone at 989-631-0900.